I am Heather: the wife, mom, and writer of this here blog. I started blogging on a whim back in 2002, just a few weeks after I started dating a new guy. I’ve blogged through cross-country moves, job changes, pregnancy, loss, and all the other things life has thrown at me – including marrying that new guy. I was the kid that started a new diary every January 1st and abandoned it a week later, so keeping a blog for fifteen-plus years is not only a surprising accomplishment, but one of the best gifts I’ve ever given myself. I’ve had three completely different careers in my life – one was in the A&R department at a major record label, another was in sales for a professional baseball team. Now I’m a freelance writer, and you can find my work at places like Washington Post, Huffington Post, BuzzFeed, Redbook, Mommyish, Mommy Nearest, and more. Mike and I wrote a book called The Toddler Survival Guide: Complete Protection from the Whiny Unfed that was released in August 2018. I am pretty certain you would love it (or know someone who would). I work when my kids are sleeping, which usually means I get about five hours of sleep a night. Somehow, it works. 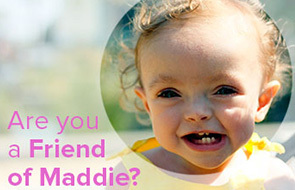 Please visit the charity Mike and I started in honor of Madeline called Friends of Maddie. My posts about grief are here. I was a featured panelist for Momversation. The list of things I want to accomplish in my life can be found here. If you need to contact me, go here.